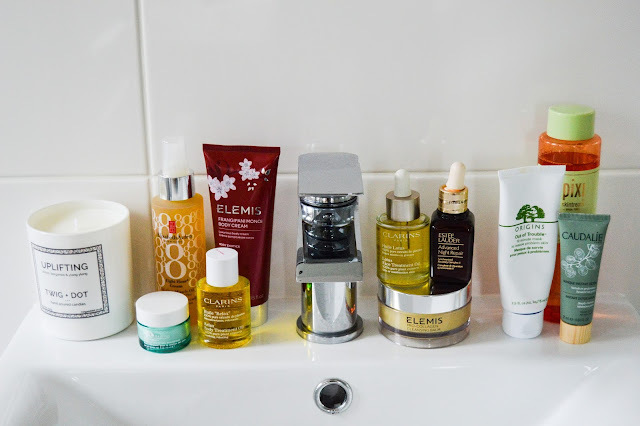 Following my recent treatment at the Clarins Spa in Debenhams Chester, I wanted to use some of the tips and tricks I had learnt to create my own at home facial. Creating a relaxing atmosphere at home can be difficult, set a time where there will be no interruptions. I recommend a Lush bath and lighting a candle, I particularly like the Twig and Dot Uplifting candle. It has zesty lemon, bergamot and ylang ylang notes which make a welcome change from lavender, it’s a scent that puts a smile on your face. Make sure to apply moisturiser after the bath to really pamper your skin, I’m currently loving the Elemis Frangipani and Monoi Body Cream and the Clarins Body Treatment Oil, they both leave my skin baby soft. Take time when cleansing your face, use upward strokes and circular massages on the skin to work the product in. 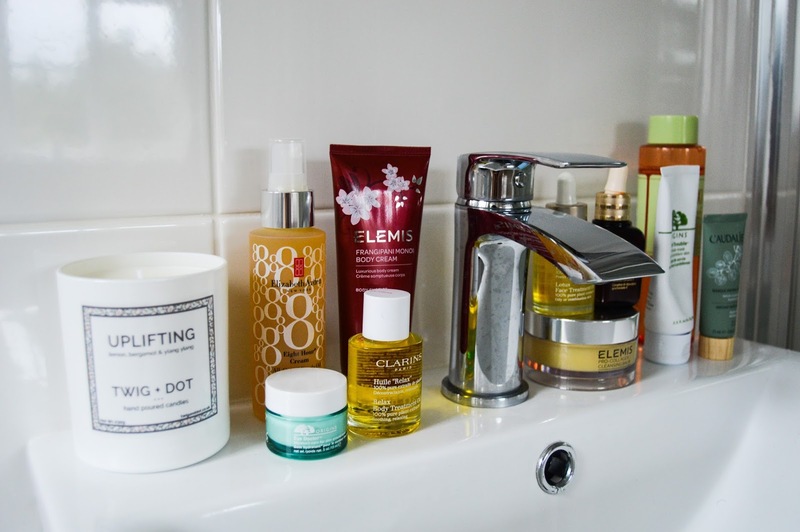 I would recommend a balm like Elemis’ Pro-Collagen Cleansing Balm, the heat from your skin turns the balm into a lovely oil, which melts makeup and grime away. Make sure you have plenty of hot flannels at the ready to remove the products. While at the spa, the therapist used gentle sweeping motions, never scrubbing at the skin as this can cause trauma to the upper layers of skin. Once the skin is clean, it’s a blank canvas waiting for your chosen products, I will always use a mask as the next step after cleansing. You can address more than one skin concern at a time with ‘multi-masking’. 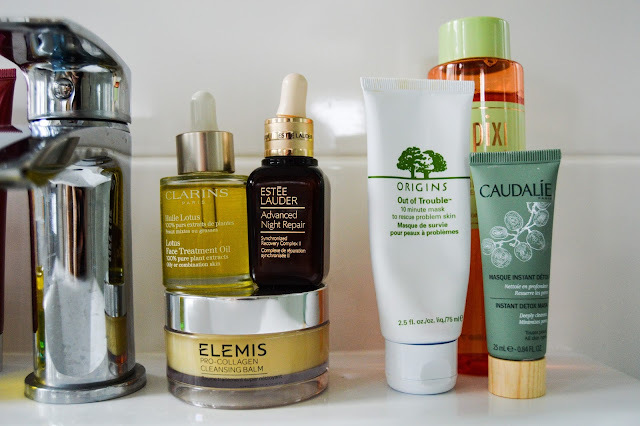 I picked the Origin Out of Trouble Face Mask and the Caudalie Instant Detox Mask, targeting my blemishes with the Origins formula and the rest of my face with the detox mask. The Out of Trouble really does calm your blemishes when they are having a tantrum, I’d thoroughly recommend it to those suffering from acne. Caudalie’s Detox Mask has a very light formula but it works hard to refresh the skin. If you have chance to lie down while the masks do the work, take time to relax. Again, using hot flannels, gently wipe the mask away. You can also place a second clean flannel over the skin once it is clean to warm the skin, ready for the next products. The therapist at the Clarins Spa drummed into me how important toner is, it’s something the falls at the wayside in many people’s routines. Your usual toners will balance the skin, La Roche Posay’s Serozinc is particularly good for this, but you can also invest in an acid toner. Pixi’s Glow Tonic contains salicylic acid which breaks down dead skin cells, leaving the skin glowing. I would recommend only using this 2-3 times a week as not to strip the skin or irritate it. The purpose of a serum is to help your skin drink up your moisturiser or facial oil and help boost the repairing properties in the products. After you have used a toner, apply a light layer of serum, be delicate when you work the product in. Estee Lauder’s Advanced Night Repair has been a long-term favourite of mine for its scar healing properties. 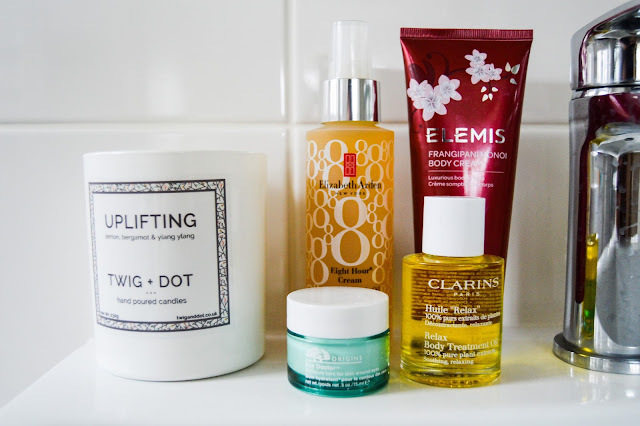 Using an oil instead of a moisturiser helps create more of a luxurious feel to your routine. I’m currently coveting the Clarins Lotus Oil and the Elizabeth Arden 8 Hour Miracle Oil*. My treatment at the Clarins Spa was finished with the Lotus Oil, it’s created with oily skins in mind so it doesn’t overload the skin. Don’t use too much oil, use the dropper or spray to distribute the oil into your hands, 2 drops is enough. Warm the oil between your hands and pat on to the face, wash any excess oil left on your hands away, you don’t need to rub this into the face. You should have a very light layer of oil on your skin, not enough to clog pores or cause any blemishes. The Elizabeth Arden Miracle Oil is a beautiful multi-use product which can be used on the face, hair and body. It's light and skins in almost immediately, it’s a perfect oil for beginners. The therapist recommended mixing a drop of water with your oil to help your skin drink the oil up. Last but not least is eye cream, I have very dry eyes, so Origins Eye Doctor restores the moisture and helps the delicate skin around my eyes look fresh. Use your ring finger to dab on any eye cream, this is an accurate way to tell how much pressure you are putting on the skin. It’s important not to be rough with the skin around the eyes as it may lead to wrinkles later on in life. Hopefully, my tips will help you create your own pamper routine just in time for the Easter break. 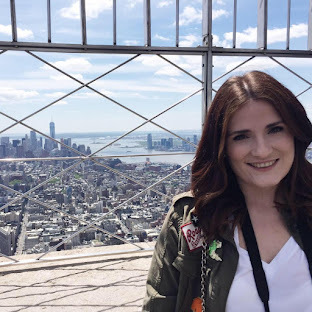 Provident inspired me to create this post, they will be sharing bloggers content in their Budget Trips and Easter Tips Calendar to help you get the most out of your Easter holidays. great roundup of products--such a nice idea to treat yourself!